There is nothing more memorable in professional wrestling than a great rivalry. The WWE has produced some of the all-time best over the last several decades and I thought it would be fun to look back and countdown the ten best WWE feuds of all-time. Wrestling fans will probably go through their lives watching a lot of wrestling. Yet it will be the memorable angle and great feud that resonates with them for generations. Those dramatic moments and intense matches will live on and be passed down through legend to future generations. Over the course of my lifetime, the WWE has produced some of the all-time best. Keep in mind that I am not ranking this as a greatest feuds blog, I am specifically looking at feuds that happened within a WWE ring. While I grew up with classic feuds from territories all over the United States, only those within the WWE were readily available to be reviewed for this blog. Fortunately you can catch most of these great matches and/or moments on the Network or YouTube so even if you weren’t watching them live, you can still appreciate the chaos. In no particular order here is the breakdown of what are in my opinion, the 10 greatest feuds in WWE history. Steve Austin vs. Vince McMahon – Let’s start with an easy one. Austin vs. McMahon is arguably the greatest feud in WWE history. If the criteria for this list was simply revenue, Austin vs. McMahon would probably top the list. Unfortunately the WWE has gone to the well so many times in recent years with heel authority figures that I don’t think we will ever see anything like this again. The timing was just right in 1997 with Vince coming off of the Montreal Screw Job, competition from WCW, the popularity of the n.W.o. bringing pro wrestling back into the mainstream, and the emergence of this biggest anti-authority hero you will ever see in a wrestling ring. Hulk Hogan vs. Roddy Piper – Next to Austin vs. McMahon I may call this the greatest feud in WWE history. It was certainly the biggest of my lifetime as a fan up until Austin vs. McMahon. The legacy of this feud cannot be understated. These two guys were pivotal in taking pro wrestling and breaking it out into the mainstream in 1984 and 1985. Sure Hogan was a great babyface but there was no other villain in the company that could transcend popular culture like Piper. The timing was absolutely perfect for these two to take the country by storm and they did. The same can’t be said for their rivalry years later in WCW and again in the WWE unfortunately. Bruno Sammartino vs. Larry Zbysko – This one was a bit ahead of my time but the legend of this rivalry has sustained several generations of pro wrestling fans. I can’t begin to explain why this one became so much bigger than others for Bruno because Bruno had plenty of allies turn on him throughout his WWE career. Yet for whatever reason, Zbysko’s defiance hit home with the fans. Zbysko breaking the chair over Bruno’s head has become iconic in its own right. The heat for their matches was ridiculous and while Hogan may take credit for it in his book, it was this match that drew a monster house to Shea Stadium in an era before pay-per-view. CM Punk vs. John Cena – It’s funny because the best angle this feud had is arguably the least memorable, which was the night Punk got up from the commentary booth and turned on Cena. Their 2011 summer series remains the biggest feud/angle of modern day era of WWE. Punk’s pipe-bomb promo was believable and fans ate up the idea of Punk leaving the WWE as world champion. Their Money in the Bank match was rated five stars by Dave Meltzer which is incredibly high praise. Whether it has the sustainability of the others on this list remains to be seen, but on this date it was one of the all-time best. Hulk Hogan vs. Randy Savage – The WrestleMania V rivalry remains an iconic feud from the 1980s era of pro wrestling. 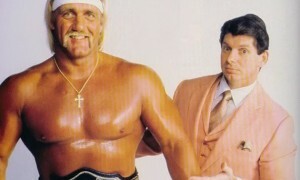 Fans today still talk about the great match and classic angle which saw Savage turn on Hogan on prime time television. The year-long build is patience that could pay off today if the WWE had a different mindset as opposed to the hot-shot angle and match. Hogan gets a lot of criticism for his work rate but all you need to do is check out their WrestleMania V match and others in the 80s to see Hogan and Savage for that matter at his best. Chris Jericho vs. Shawn Michaels – This is a feud that probably doesn’t get as much due as it should. The angles and series of matches throughout this lengthy rivalry remain some of the best from the last decade of WWE wrestling. Their Ladder Match in particular still sticks out as an all-time favorite. Between Jericho punching Michaels’ wife and almost blinding the Heartbreak Kid you won’t find many better heels in the last decade than Jericho was during this historic period. Steve Austin vs. Bret Hart – Austin vs. Hart remains one of the greatest rivalries which produced arguably the greatest WrestleMania match in history (my favorite anyway). What made this one so good? I think it goes back to the Survivor Series 1996 hype and Austin telling the world that no matter what happens in New York City, the feud will never end…and it didn’t. The feud was intense, believable, dramatic, and the two just had such great chemistry that it wouldn’t have worked with anyone else. Both guys had chips on their shoulders with Bret obsessing over Shawn Michaels and Austin obsessed with proving WCW wrong after he was released. The hunger and desire out of both guys is evident in everything they did which is why it was all so great. The Rock vs. Steve Austin – How can you go wrong with three WrestleMania main-events? While you would riot today if you saw Randy Orton vs. John Cena three times at Mania, every match was bigger and better. The timing and worlds aligned for these two to make beautiful wrestling music together. Unfortunately I don’t think this one paid off nearly as much as it should have with Austin leaving after their final match at WrestleMania 19 and never following through on his revenge. Yet there are plenty of great angles leading up to 15 and 17 readily accessible on the Network that will make you a believer if you have any doubts about how fun and memorable this feud was in its heyday. Mankind vs. The Undertaker – One of quite possibly the most underrated feuds in WWE history would be The Undertaker vs. Mankind. Sure, this one will always be remembered for Hell in a Cell but there was so much more. For over two years these two guys waged one of the most brutal and bloody wars ever seen in a WWE ring. Mankind debuted and immediately jumped into a feud with Taker. Mankind wasted no time targeting the Dead Man as he picked a fight with Taker on his first night in the company. The next two years saw dozens of vignettes and matches showcasing the brutality of this deadly rivalry. Pick any match on the Network between these two and I can guarantee you that it will be just as exciting now as it was almost 20 years ago. Triple H vs. Batista – It still amazes me that someone who was involved in a legendary rivalry like Batista was crapped on by the new generation of fans so badly when he returned last year. I think the WWE could have helped him out quite a bit if they went back and showed old footage of his rivalry with Hunter. What made this so good is that it had been brewing for months. Batista would shoot these subtle looks at Hunter for months prior to their match that let the fans know that it was coming. This allowed the rivalry to simmer for months before it finally boiled over into one of the greatest segments in RAW history (right up there with their contract signing). Batista won three straight matches and yet the fans couldn’t get enough of this rivalry. Again, this is another case in patience paying off at the box office for the WWE.